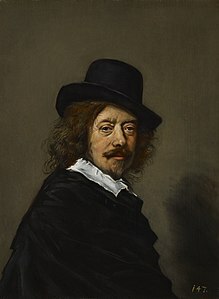 Copy o a sel-portrait bi Frans Hals. Frans Hals the Elder (Dutch: [ɦɑls]; c. 1582 – 26 August 1666) wis a Dutch Gowden Age portrait penter wha lived an wirked in Haarlem. This page wis last eeditit on 6 Apryle 2016, at 21:00.